Best foot forward: Walkers, including Prime Minister Harris, on the Island Main Road at Mansion on their way to Ottley’s. 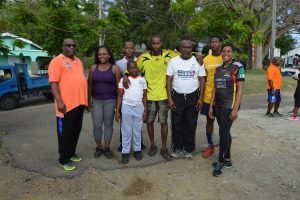 Some of the health walk participants pose for a group picture with Prime Minister Harris at the end of the walk at Ottley’s Hard Court. PLP Deputy National Leader the Hon. Sen. Akilah Byron-Nisbett finishing sixth. Behind her are Aba Webster, David Webster and Sonia Henry. 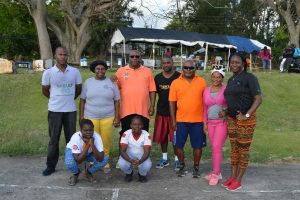 Top seven finishers are pictured with Prime Minister Harris (left) at Ottley’s Hard Court. The Hon. Akilah Byron-Nisbett (right) placed sixth. Participants from Constituency No. 5 (Sandy Point), including the youngest walker Edward Williams, 10 (squatting right). 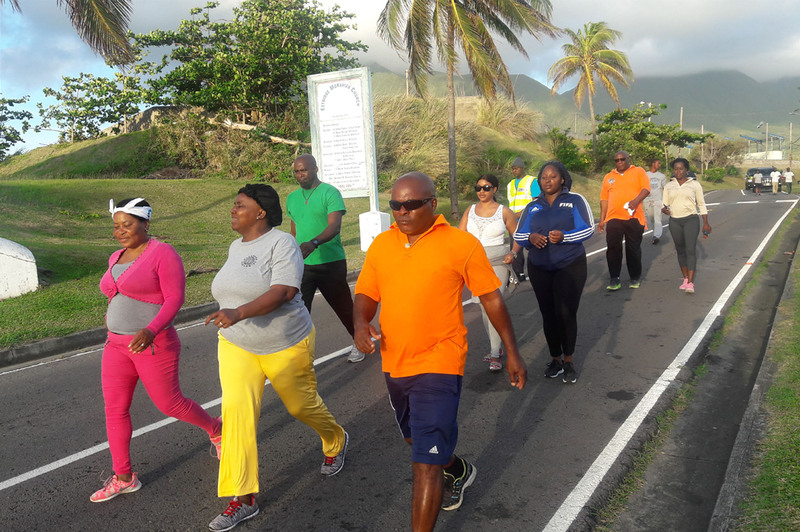 BASSETERRE, St. Kitts – Many health-conscious walk enthusiasts are now looking from a competitive angle at the Peoples Labour Party/Prime Minister’s Health Walk offered each month. 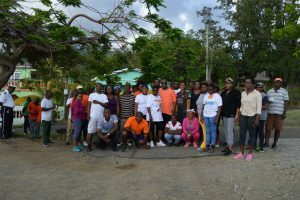 Participants are drawn from all parts of St. Kitts, and members of an elite group of walkers have been plotting to outdo each other as to who gets to the finish point in the top position. 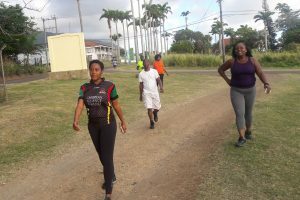 The latest health walk took place April 28 in Constituency No. 7, starting from Belle Vue, and Damien John got to Ottley’s Hard Court in top position. Coming in second position is a perennial top finisher, Patrick Adned, and right behind him was Edward Williams, 10, from Constituency No. 5. The young walker placed second in the last walk. Vernon Henry was fourth while walk veteran and Peoples Labour Party’s founding member William Phillip fifth. There was quite some excitement as PLP’s Deputy National Political Leader the Honourable Akilah Byron-Nisbett walked in still looking fresh at position six, closely followed by Aba Webster of Constituency No. 4 in the seventh place. Breathing behind their backs was another of the elite walkers, David Webster, also from Constituency No. 4, and behind him was PLP’s Women’s Arm representative Sonia Henry. A large number of walkers had assembled at the Belle Vue bus stop as early as 4:45 a.m., but the walk started shortly after 5:30 a.m., following a prayer by Sonia Henry. Participants were excited by the usual presence and participation of the PLP’s national political leader, the Hon. Dr. Timothy Harris, who initiated the event 10 years ago in his constituency. Prime Minister Harris, who is also CARICOM’s lead spokesperson on human resources, health and HIV matters, has been using the monthly event as a way of fighting the scourge of NCDs in a practical way, and its appeal has been attracting participants from outside his constituency. Last year, the monthly health walk became a national event when the Peoples Labour Party took over its organising. Following the rebranding of the event, a number of walks were held outside Constituency No. 7, drawing record participation. Saturday’s walkers enjoyed a healthy light breakfast from Yvette Bass at the Ottley’s Hard Court. Edward Williams, 10, is already training for the next event, where he hopes to arrive at the finish point in the top position.